For Downloading--just put it on your desktop for easy location. Their is no sense in searching your whole computer to find it, so a desktop is best. You found your formatted resume for free on this website, so go ahead and tell your friends about it. Have you ever tried this amazing way to bookmark us? Try now. These are 3 call center formats used most widely when you are creating or starting on your first resume. Do you like the look of them? They have a look of simplicity, yet they are still very attractive. These will make the information you put in while editing stand out, so the personnel manager doesn't have to look too hard to find it. When you first look at them, your qualifications will be highlighted and easy to find keeping their interest. 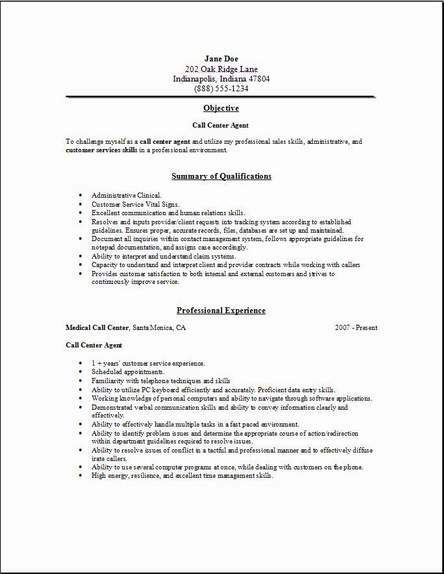 When you have entered your information on this resume while editing, your mission will be completed with an effective yet realistic resume. I take it you will find these free resumes very useful in helping with the preparation of your job hunt. Please recommend us to all your best friends, and leave some comments on the contact us page if you have more ideas that would be useful to others. Visit some of the other pages, they will also help you out. Answer calls and help customers with their questions. Relate to and describe the companies' useable services to the customer. Provide high level customized service to the customer. Arrange for products to be delivered for the customers' convenience. Have a pleasant phone voice and manner of speaking. Basic computer skills using internet browsers and e-mail programs. Fast and accurate typing skills with no grammar errors. Ability to understand when a caller is angry and to help them without responding angrily. Analyze customer problems and determine proper solution. 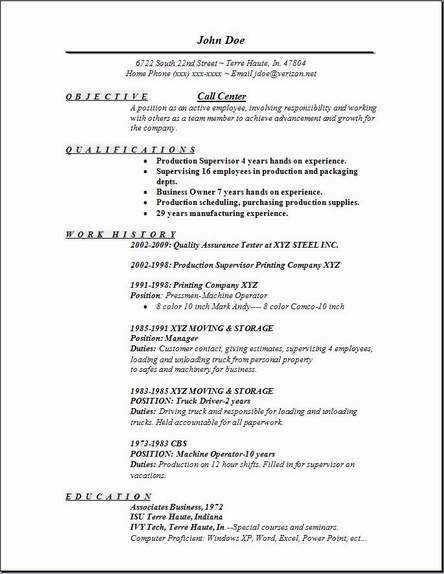 Detail oriented and can meet deadlines comfortably. Above all, a very good understanding of telephone etiquette. I would download all 3 of the great formats above,since they are supplied to you for free. Most people like Chronological, the best. Your choice, but I think any one of them, will be a good one. Edit them all just to see what they look like with your own data added to them. Then choose which one you like the best. 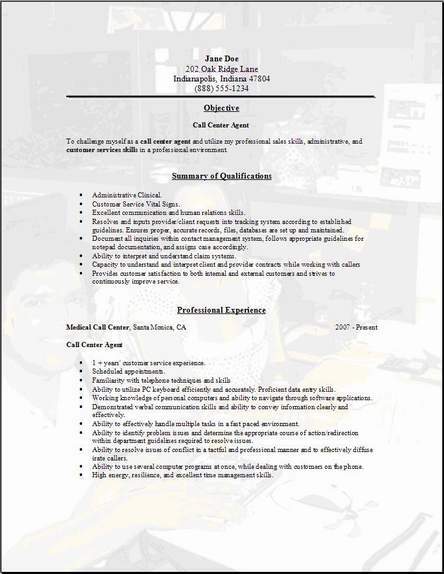 You should explore all the information contained on this website to help you create a stronger call center resume. More help is always available by using or looking at the other examples on this website when deciding how to arrange the information you need for your call center resume. There's always plenty help and lots of opportunities here that await you. Dig through the information till you find the help you can utilize. I wish you great success. Link code provided for this page below. Make your friends happy! Share.